Richmond has become a top destination for food & beer enthusiasts. With over 1,300 full-service restaurants and more than 30 breweries serving up fresh, innovative creations, RVA is receiving accolades worldwide for its thriving food and beer scene. If you’re an aspiring restaurant or brewery owner looking for an experienced local general contractor, we’d love to help you bring your vision to life. Why choose Hunnicutt Construction for your Richmond restaurant? · Experience. Brewery and restaurant projects require specialized mechanical, electrical and plumbing components, and must meet Virginia’s stringent health and safety codes. In addition to normal building and fire code requirements, these projects are subject to both ADA guidelines and Health Department regulations. 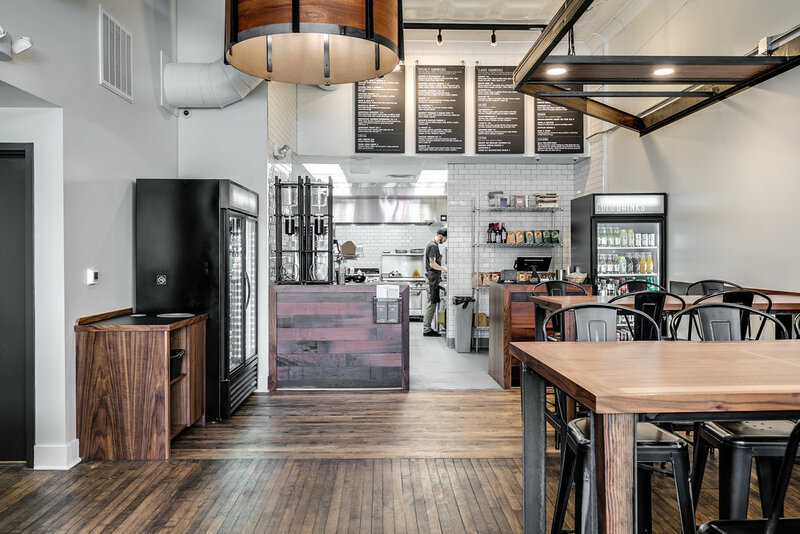 We’ve been constructing restaurant spaces for decades and have a thorough understanding of both the Richmond market, and the needs of owners. · Knowledge. Hunnicutt Construction understands that restaurant and brewery projects encompass two very different spaces. Front of House construction includes the exterior, entry, dining areas and customer restrooms. This space requires the installation of a variety of complex finishes; security, fire suppression and point of sale systems, as well as built ins and signage. Back of House construction encompasses the specialized mechanical systems, electrical and plumbing that support the kitchen, brewing equipment, piping, fire suppression & ventilation, the workspaces, refrigeration systems, and the installation of specialized equipment. · Design Build Services. Overseeing your project from start to finish as a team ensures that the entire build and finished project is aligned with your vision. From preconstruction discovery, to selecting the right finishes and equipment, our staff of pros is invested in your success from day one. · Value Engineering. It’s a fact-most restaurants operate for a year before becoming profitable. As a family owned General Contracting Company, we work to keep our overhead- and thus your costs- down. By fine tuning your budget items and utilizing our extensive network of trusted subcontractors and suppliers we can help you focus your spending on the items that matter most, without sacrificing quality. The end result? Your project stays within your budget allotments, allowing your new venture to become profitable faster. · Enthusiasm. We aren’t just General Contractors – we are foodies too! We represent your future customer base, and we love helping new restaurants & breweries make an impact on the exploding Richmond culinary scene. Check out our gallery of completed projects. Our team of hungry construction pros welcomes the opportunity to help you bring your restaurant or brewery project to the diners of Richmond. Contact us to discuss how our business can help your business thrive.